In the "What the...?" category of modified Saabs, this unusual 3-axle Saab/Volvo is for sale in Sweden. Thanks to Tenfour for the tweet. A completely unique car built by Wiman coachwork in Sandviken, front Saab 900 Turbo, Volvo 855 rear, 70 W, 3 axle nybes. New tax. Nearly 1,000 hours of work to get the car on the wheel again. Probably the only remaining copy of this particular model. Mileage unknown and uninteresting as it is mostly new and changed. Paint Ford Focus RS Pearl Metallic Orange. I searched a bit more on Google and Wiman in Sandviken also made this Saab 9000 ambulance. Appearantly, this is not the only Saab 900/Volvo with 3 axles/6 wheels. Look at the plates, Wulf - that Varmeakuten signwritten one is the same one, just resprayed orange and with a rear light change. The 240-cross actually works quite well - it's just a shame that the rear is so instantly identifiable, I think. I prefer the totally custom job (based off a 5 door from the looks of it, though a 4 door would work as well). Looks like it'd be fairly simple to weld that up from a five door, eh? Kinda reminds me of a Subaru wagon. I'd do it from a four door because they're more plentiful in the USA. 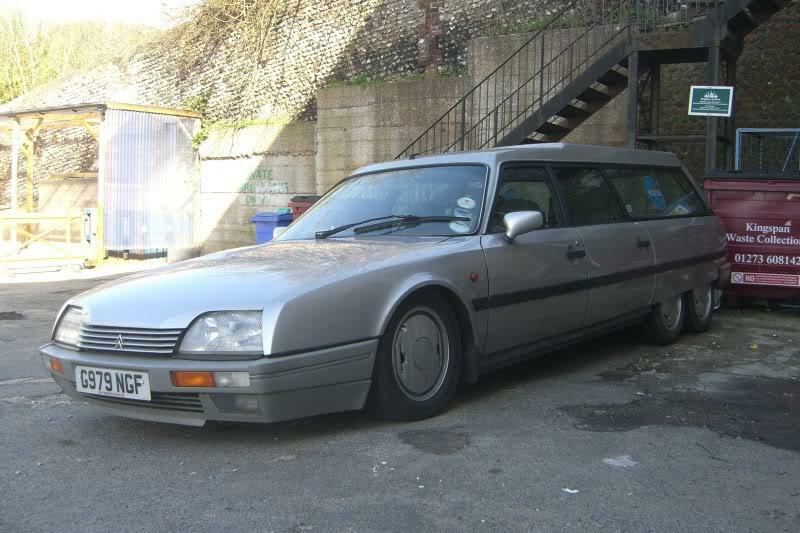 All these three-axle SAABs remind me of the Citroën CX Loadrunner. A bit more common than the one-off SAAB wagons, flatbeds, camionettes, and panel trucks, but certainly not as creative!